HOW TO MANAGE YOUR CAMPAIGN? Fueladream provides you with a unique & useful facility in crowdfunding - a comprehensive dashboard to manage your campaign (think of it as your command centre or a cockpit console). All the information & data pertaining to your campaign is consolidated & keeps getting updated real-time, so as to give you the current status at all times. This helps the campaign owner to get an overview of their crowdfunding campaign, number of conversions (no. of visitors to no. of Funders), key strike rates, and the activity feed from this campaign. The campaign owner will be get their performance and forecast with comments on how to reach goal if it is falling short. It gives you a snapshot of the number of rewards claimed, at each contribution level on the crowdfunding campaign. Social Media metrics are also included. Updates are what your Funders look forward to. 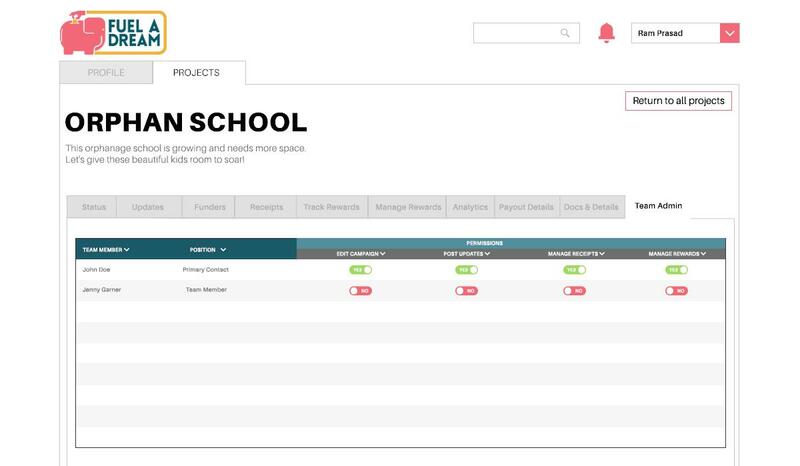 This tool allows you to keep in touch with your funders from whether in India or anywhere in the world. In this tab, Campaign owners can post updates straight from the dashboard about the status of the crowdfunding campaign. Updates can include text, images and videos - anything that is clear & makes the most impact. For example, to post a cost sheet, take a photo of the same & upload it for your funders to see. You find an error, after you post an update? No problem, you can also make edits to previous updates on the Fueladream platform! This is an as-on-date list of all your funders & the contributions they have made to your crowdfunding campaign. You can sort this list to understand for example who the largest funder is, how many are from which city, whether they are Indian or foreign funders, what is the gender mix, etc. At the bottom, it also gives you a summary snapshot of all Funders & their contributions to your crowdfunding campaign on fueladream. This outlines the list of funders with information on their receipt & refund status. For all funders, receipts are auto-generated within 96 hours after the remittance is made from Fueladream into your bank account. All the receipts can be viewed from here. To send receipts you need to CLICK ON the SEND button after the money has been remitted into your bank account. Funders will get their receipts through email and it will also be available as backup in their Fueladream profiles. Campaign owner can get information related to how many funders have claimed each of the rewards you have offered in the crowdfunding campaign & how many are in balance. There is also an option for campaign owners to request the Fueladream admin team to edit the number of rewards being given. If for example one of the rewards is very popular & is running out of stock, you may want to increase numbers mid-way through the crowdfunding campaign. Just send us a request. In this tab, you can download the contact details of all the Funders to send them the promised rewards. Post that you need to update the status of the fulfilled rewards - click Yes, after sending and enter the date of dispatch. The tab allows you to get a sortable list of rewards and the contributors claimed with a status indicating the dispatch status. This tab gives you a more detailed look at the numbers, wherein you can get more insights on your crowdfunding campaign with respect to sources of traffic, visitor and funder related statistics, geographical break down of funding and ratings & engagement data. Campaign owner can download the data as Excel/ PDF/ CSV. This tab consolidates all the key financial information regarding your crowdfunding campaign - for your ready reference. Information about the goal, timelines, funding model, your bank account details, contractual fees, expected disbursal amount & date. This tab is like a vault, where all you can access all the "due diligence" documents that you have submitted to Fueladream while you were creating your crowdfunding campaign. All documents that are uploaded during the account registration & the campaign creation, can be found here. If you want to update any of these documents, you can send a request to Fueladream with the revised document details. 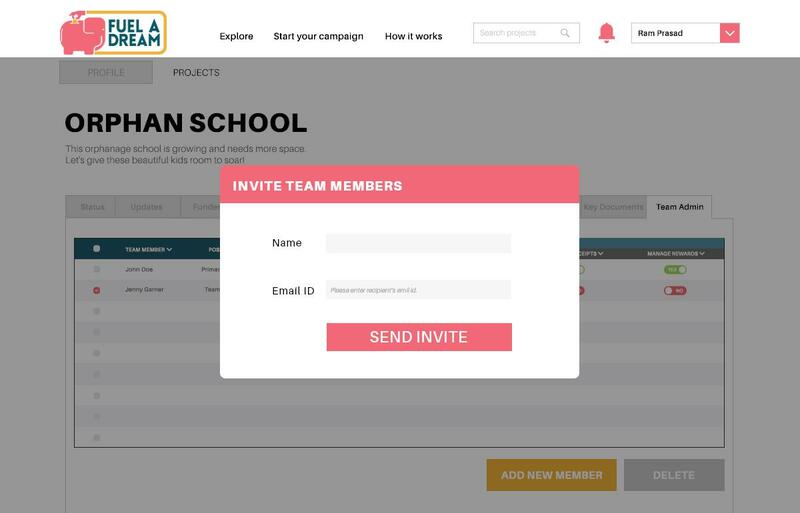 This tab allows you, as the Primary lead of the crowdfunding campaign, to assign roles within your campaign team (as in, setting who does what). You have provisions here to add/ remove members from the crowdfunding campaign team, or even change the responsibilities.